I recently fried up some chickpeas to use as croutons in a salad, and they were so damn good, a large portion of them never even made it to the salad. So crispy and light, it was insanely challenging to walk by without shoving some in my face. They truly made the salad, but it became clear very quickly that they could easily stand alone. Initially, I wanted to go with a bold flavor for these. Something polarizing, like wasabi or paprika. But as I thought about it more and more, I realized that maybe keeping this one simple was the way to go. They were just so good on their own with a little salt, I really didn't need to do much. A hint of rosemary provides an aromatic boost that compliments without overwhelming, and after the first bite, I decided that was all I needed. Why mess with something that's already delicious? These olive oil fried chickpeas are a healthy and indulgent snack that you don't have to feel guilty about. Deliciously crispy with a hint of fresh rosemary, you're going to love these as an insanely easy appetizer, or quick snack. Go bold and season them with your favorite herbs and spices, or keep em simple. You really cannot go wrong with these delicious fried chickpeas. Heat oil in a large skillet over medium high heat. Add chickpeas to the skillet and cook until golden brown and crispy, stirring occasionally, for about 15-20 minutes. Using a slotted spoon, transfer chickpeas to a paper towel lined plate. Let drain slightly, then transfer to a medium bowl. 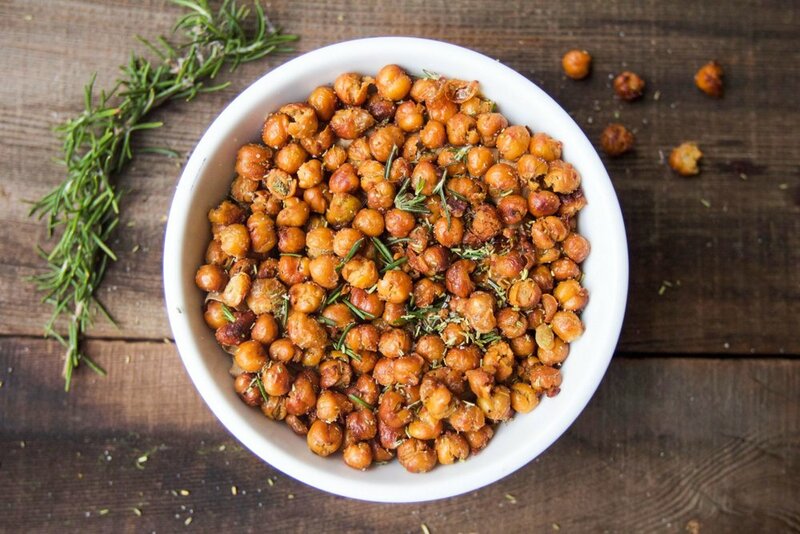 Sprinkle rosemary and salt over chickpeas and toss to coat. Serve warm. Make sure you at least partially dry off the beans before adding them to the hot oil. Hot olive oil and water do not mix. Draining them in a colander and patting them dry with a paper towel worked perfect for me. You can also use a different oil, like vegetable or canola, but keep an eye on them, as the cooking time might need to be modified.